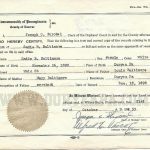 Do you have a delayed birth certificate for Wyoming County? Paula is currently extracting these to be collected into booklet form and sold at a nominal fee as a fundraiser for the society. Delayed Births were recorded for people usually born between 1893 and 1905 (but sometimes earlier) whose births were not initially documented by the county, but who needed proof of their birth date and place later, mostly for Social Security.